The portrait of Bob Dylan in the film “I’m not there” demonstrates how a lack of father-specific structure is compensated by a powerful and extraordinarily creative but volatile and defenseless Puer structure; and the movie further illustrates the tendency of the Shadow complexes to rise to repair such psychic vulnerabilities and restore equilibrium. The psychic imbalance leads to a powerful fight between the archetypes of Senex (shadow to Father) and Trickster (shadow to Puer) exploding in black and white scenes mirroring a schizoid layer of the psyche being aroused. This battle not only exposes what one must go through in order to individuate; it also shows how the related functions of consciousness develop in accordance with that fight. Individuation brings deliverance from opposites at the archetypal as well as the typological level. Due to that fight, these two archetypal characters enable opposite functions of consciousness to work separately without being fused with content from the other functions, empowering them to stand up for themselves. Each of Jung’s eight function-attitudes, to the extent that it is undifferentiated, is “carried” by the emotional energy of an archetypal complex. The four function-attitudes which tend to be more conscious (referred to herein as the “ego quartet”) are ego-syntonic in nature. The four other function-attitudes (referred to herein as the “Shadow quartet”) tend to remain unconscious and are ego-dystonic in nature. The auxiliary and tertiary function-attitudes (carried by the Mother/Father and Puer/Puella archetypes, respectively) form an “axis” of how we interact with our environment. The sixth and seventh function-attitudes (Witch/Senex and Trickster) form the ego-dystonic, shadow axis of unconscious interaction with our environment. Directed by Todd Haynes, the film is inspired by “Bob Dylan’s music and many lives” (2007). Five characters play seven different figures that, according to the movie poster, are “all Bob Dylan.” The title suggests that there is no ego and that all of the characters who represent Dylan, the Dylan doppelgangers, must be operating beyond ego consciousness. Two of the seven Dylan characters are played by the same actor. None of them carry the name Bob or Dylan. Five of the actors are men and one is a woman. One is black and five are white. One is young, one is old, and four are in-between. One of the Dylan’s is dead in the beginning of the film and in the end of the film this character is hanging in the air, just as the answer is “Blowin’ in the Wind” in the Dylan song (Dylan, 2004, p. 53). Their names are Woody, Jack Rollins, Robbie Clark, Billy, Jude Quinn, Arthur Rimbaud, and Pastor John. The film has the qualities of a Bob Dylan song, innovative and circling around issues—awakening and difficult to grasp at the same time. The portrait is an interweaving of music and life situations presented as kaleidoscopic and non-chronological complex images without apparent order. We are introduced to an artistic postmodern tale with no forward-moving epic structure. Yet it is somehow easy to sense an underlying natural human tendency for development from unconscious towards conscious, and thus more differentiated stages, from psychic imbalance towards psychic balance. The Dylan doppelgangers introduce us to the many facets of Dylan’s life and music: His sources of inspiration, his development, his character as a lover and husband, and his period as newborn Christian are all portrayed in the film. An ocean of archetypal events, figures, symbols, and motifs portrays Dylan’s life and music via the lives and transitions of numerous characters. One character almost drowns in a flood, another feels he is “swimming in lava,” another is thrown in jail. Yet another lies dead on the autopsy table. With one exception, the characters are in constant movement—on foot, on train, on motorbike, in an airplane, on horseback, in cars—all symbolic of the swift, vivid activity of mental processes. Only one of the Bob Dylan doppelgangers remains seated on a chair throughout. The portrait mirrors a multifaceted person at different stages of life in a variety of scenes; and while some of the scenes are naturalistic and in color, other scenes are schizoid, rendered in black and white. Some scenes are archaic while others are sophisticated and surrealistic. The movie focuses on the sixties and seventies, a time of conflicting opposites in western society: black vs. white, young vs. old, feminine vs. masculine, and all of these conflicts are embodied in the characters. Beebe says that a poorly structured or poorly integrated complex becomes visible in the expression of the function-attitude embodied in that archetypal complex (1988, p. 346), and we see this in the film’s characters. Four of the Dylan’s are operating on the Father/Puer Aeternus axis and two on its shadow counterpart, the Senex/Trickster axis. The functions carried by the Parental and the Puer archetypes in the film are Thinking and Feeling respectively, and while immaturely expressed in the ego conscious part of the psyche, these two functions—with opposite attitudes—are separated from the whole due to their fight. By the end of the drama, the extraverted feeling (Fe) becomes differentiated, thanks to the development of a strong Trickster figure. According to Beebe, a parental archetype behaves in a parental way whether it is helpful (Good Parent) or critical (Witch/Senex) (2004, p. 106). Parental archetypes (Father/Mother, aka Good Parent) can take the lead in fostering the development of other people and often serve as role models. The auxiliary or Good Parent function has a particular attraction to the third function carried by Puer/Puella in others (Beebe 2007b, p. 22). The film seems to confirm this attraction between Parent and Puer, suggested by the horizontal axis (“the arms”) of Beebe’s model. If we consider the characters as sub-personalities, representative of different functions and archetypes, then the archetypal set-up in the ego-syntonic quartet comprises three characters that represent the Puer Aeternus and one character that represents the Father archetype. • “Woody” is an actual child, not a grown one. He is eleven years old, black, and comes from the city of “Riddle.” He started vagabonding with his guitar when he was six years old. Masquerading with a stolen persona as the legendary folksinger Woody Guthrie, he gets help from women and gets into trouble with men and society, in classic Puer fashion. He also runs away from family and authorities and disappears. 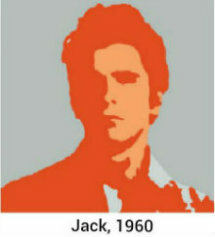 • “Jack Rollins” is an adolescent puer. He is, in fact, the younger version of the main father figure, Pastor John. Young Jack requires the help of a prominent folksinger and the protest movement behind her to get on stage. This woman ”introduced him to America,” stating that he had something to say, that “he spoke for her.” Jack can write astonishing contemporary songs but at the same time he is shy and clumsy, saying the wrong thing at the wrong time. 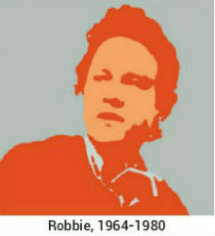 • “Robbie Clark” is an adult Puer, a Hollywood actor who runs away from women and from his responsibility as a father. He falls in love with a French woman, has children, and gets divorced. He is a womanizer with several affairs. The fact that one of his women is a stewardess shows him as a really high-flying Puer. With such a strong Puer element in the film, it is not surprising that all of the apparent father figures in the film show problems. The child, Woody, informs us that there have been no ordinary parents in his young life since age six; and in the group of those who “are all Bob Dylan” there is no father-figure until about age forty, when Pastor John is introduced, late in the film. Woody himself has stolen his persona from the real folksinger Woody Guthrie, whom young Woody admires. In Jungian terms we can see the real folksinger Woody Guthrie as a father in projection. When the boy visits Guthrie unconscious and dying in hospital, we witness a kind of father loss—and in that moment the young Woody disappears. Jack Rollins also disappears and belatedly transforms into the Father figure Pastor John. Pastor John has been living in hiding for twenty years, which suggests a lack of fatherly presence in the Dylan figure portrayed here. The fact that he runs away and changes his name suggests that he is running away from his persona. The adult Puer, Robbie Clark, is an absent father himself. All of this indicates a poorly constellated Father complex. The Puer characters have problems too but they are all creative and talented. Woody plays and sings “with no formal training.” Jack is a “troubadour of conscience” and “the hope for the new generation,” able to write contemporary songs that the prominent folk singer would like to write herself but can’t. Robbie is a “talented actor in Hollywood.” And the Puer figures all get support from strong women. Woody is supported by a black motherly type who tells him, “Live your own time, sing about your own time my child!” She also offers him food and a place to sleep. Jack is supported by the prominent female folksinger who introduces him to her American audience. Robbie is supported by the Frenchwoman who becomes his lover and introduces him to the French surrealistic poet Arthur Rimbaud and thereafter takes care of house and children while he is busy with his career and affairs with other women. As these tensions grow stronger, they become constellated in external reality: Hobos attack Woody and the juvenile center chases him away; Jack Rollins’ former fans boo him offstage when he does not want to continue supporting their protest activity; Robbie divorces and the authorities award custody over the two daughters to his wife, and paparazzi harass him. As things go progressively wrong, the Puer figures evaporate one by one. After visiting the dying father with whom he identifies, Woody disappears. After being booed out by former followers, Jack disappears. Although he will come back later, Robbie leaves for France and to another remote place after the divorce. It seems as if a “running-away shadow” is active. Because we know the Hero (Dylan) is white, Woody is special because he is black. In Eurocentric culture, black often represents the shadow. It appears that Woody is reflecting a shadow established at the age of six and handed over into later stages in life where Jack and Robbie perpetuate the “running-away shadow.” In a speech at an award ceremony, Jack, obviously uncomfortable at being allied with the demands of the protesters, gets drunk and tells the audience that he can feel inside what Lee Harvey Oswald felt when he shot President Kennedy. The fact that Jack identifies with a murderer shows the power of a personal complex and how it can be mixed up with the cultural complex of a whole nation. With his new persona, Jack—in his Pastor John aspect, age about 40—is now preaching that ‘pop and rock and roll’ are the devil’s work. In doing so, he rejects his former Puer activities: the activities as a contemporary singer-songwriter when he was Jack. Now he sings the song “Pressing On” (Dylan 2004, p. 430). In that song he is “pressing on to the higher calling of my Lord.” James Hillman, quoted by Donald Kalsched, stated that the negativity of Senex reflects a split in the primary archetype, Senex and Puer. “The negative senex is the senex split from its own puer aspect. He has lost his ‘child’.” This ‘child’ in turn, is an “avatar of the Self’s spiritual aspect, a vision of our own first nature, our affinity to beauty, our angelic essence as messenger of the divine, as divine message” (Kalsched, 1996, p. 104). We can see the “beauty” of the Puer in the film’s three Puer figures: Together they form a richly structured archetypal Puer complex that compensates a poorly structured Father complex . Puer is talented, creative, and able to exit when troubles occur. Puer can take another persona and run away from it when it becomes uncomfortable. But Jack’s impulse to kill the president points to a Father complex. When Jack later transforms into a Father-figure, Pastor John, his preaching against his former Puer activities suggests that he rejects his inner spirit. He has become Hillman’s negative Senex split off from its own Puer. The tragedy of this is that Pastor John’s driven search for God is connected to a deep longing for an internal well-functioning Fatherly structure. Due to the imbalances in the archetypal pairs of opposites in the ego quartet—before the personal Father figure of Pastor John is invented—unsolved problems in life are being compensated by unconscious “inner realities,” the shadow complexes. When a richly structured Puer complex compensates a poorly structured Parental complex, what does that mean for the shadow personality? The film suggests two answers: 1) that the auxiliary function, carried by the Parent archetype, will be projected onto others; and 2) that the Trickster archetype, which shadows the Puer, is concomitantly stronger than the Senex archetype, which shadows the Parent. The Senex and Trickster archetypes represent the shadow of the arms, the lower horizontal axis of the Beebe model. The polar dynamics and the shadowy aspect of the Senex-Trickster drama are represented by the black and white cinematography of these scenes. In this drama, a dogmatic Senex with his old standards offends Trickster who, as a forerunner in the psyche, has no standards. In this case, the polarity is along the Thinking/Feeling axis. Senex demands standards and Trickster has none. A new persona is created out of the energy of the Trickster, embodied in the character of Jude Quinn. Quinn is a Dylan doppelganger of indeterminate gender, played by actress Cate Blanchett. Opposing Quinn is a BBC journalist named Keenan Jones, not a Dylan doppelganger, who acts as the Senex in the film. 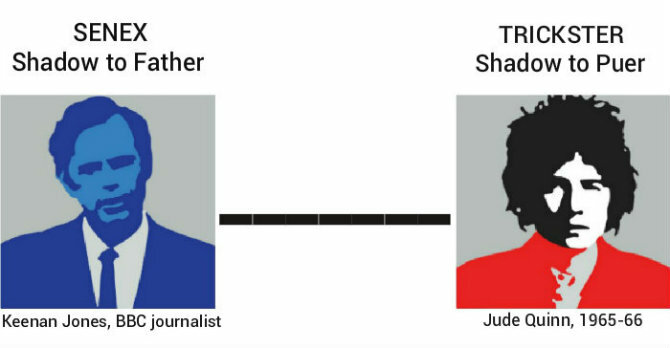 The fact that Jones functions as a Senex in projection rather than an internal Senex suggests that the Father complexes are projected and not integrated. The Jude Quinn Trickster, as a shadow of the Puer Aeternus, stands up to the Senex instead of running away. When Keenan Jones challenges him to identify with either good or evil, Quinn rejects the urge to dissociate and manages instead to hold the tension in the confrontation with the Senex. At the end of the drama, a stage of agreement has been reached in this pair of opposites and in society as well. The archaic archetypal conflict is resolved and the deliverance from opposites leads to redemption at this stage. All these situations indicate a parental extraverted thinking that in the first place is projected onto maternal women. By experience, this projection of Te is differentiated and made partly conscious (integrated) with the Puer figures. We witness the beginnings of such integration of Te when Woody says that he will sing a contemporary song but then it is actually his follower, Jack, who sings the song. We see it again when Jack transforms into Pastor John, who uses Te in his judging evaluations in relation to God and the Devil; and again when Robbie reads Rimbaud himself after the divorce. Pastor John, when preaching and inspiring his community with rules for a Christian life at the end, represents a partly differentiated and integrated Te (but only partly, because he splits off his Puer). While the three Puer figures seem insecure and overly dependent on the Te women, the Senex-like Pastor John seems a bit too sure of himself when he preaches. His contact with the authentic inner creative spirit of the Divine Child from the true self seems to be lost. What this means to the introverted feeling (Fi) Puer and the T/F dichotomy in the ego quartet in general, we don’t know. We have to analyze what is going on in the shadow quartet. According to the guidelines of the eight-function model we know that the functions in the shadow quartet are the same as in the ego-quartet but with opposite attitudes. Keenan Jones then carries introverted thinking (Ti) and his harsh standards are suited to a shadowy Ti Senex. Metaphorically killing his audience with machine guns while singing that he doesn’t want to work on their farm anymore, Jude Quinn plays the shadowy extraverted feeling (Fe) Trickster par excellence. As a Trickster, he is rebellious towards demands of standards—in this case the Senex’s demands that his strict standards for emotional expression be met. He engages his extraverted thinking Te function, but as Trickster he has no such standards. As a Trickster he potentially is a forerunner for a ‘new kingdom’ with the capacity to stand up against the old king and his kingdom in this shadow quartet. What could not be enacted in the ego quartet is sorted out in the shadow quartet and we witness a deliverance from opposites in the horizontal pair of opposites, after which extraverted feeling can operate distinctly, both differentiated from and in harmony with its opposite function, introverted thinking. Although this transformation seems to be fulfilled, it is hard to trace a similar transformation in the ego quartet of a Te Father figure rejecting his former Puer qualities. We can only guess that introverted feeling, carried by Puer, will be lying more in the shadow at that stage of development, and that what is to happen later in life is not portrayed. Analyzing the archetypal drama in this film portrait, we can conclude that a poorly structured Father complex (probably due to the absence of an actual suitable father figure in early childhood) is compensated by a strong Puer complex. This imbalance becomes visible in the expression of functions. Until a personal Father figure is developed late in life, the Parental function Te is projected onto women who express clear and well defined extraverted thinking. Meanwhile Fi, as is generally the case with introverted feeling, is almost invisible throughout. Yet there are glimpses in the Puer figures of rising Fi. E.g., when Woody gets the advice that he shall sing songs from his own time, we are seeing Heroic introverted intuition (Ni) embodied in the “I” that is not there, unconsciously at play with an immature Fi Puer. Bob Dylan, the actual man, is the hero behind the portrait and he is present in the very last scene of the film playing his famous song “Mr. Tambourine Man” on his mouth organ in a deeply introverted way. He is the “I” that is not there. The main part of the song goes: “Hey, Mr. Tambourine Man, play a song for me, in the jingle jangle mornin’ I’ll come following you” (Dylan 2004, p. 152). I Interpret that song as a call from the Self, a call that the singer (or mouth-organ player) will follow, which tells me that he is connected to deeply introverted images, as is the case for an introverted intuitive personality. When this inner Hero gets a hunch, Puer immediately finds the right deep feeling to validate and adapt to the advice—after which, he moves on creatively but still unconscious and with mixed-up functions. After a series of failures, the richly structured Puer energy turns into its Trickster shadow. In a fight with the Father in its Senex aspect, Trickster transforms a poorly developed capacity to stand up against Father figures. (And if we want to be in contact with our true selves, we must stand up against them!) In this process the typology is developed and, due to the fight between these two archetypal characters, Fe embodied in the Trickster is being differentiated and at the end of the film becomes well defined and clearly expressed. This observation helps us realize that type development requires understanding personal complexes. The analysis of the portrait shows a correlation between complexes and type development that really asks for more research within this field of typology in depth. What, for example, is the psychological perspective when children are raised with a strong Parental/Father-specific structure and little time for playing? What is the case in families where children take over parental responsibility far too early in life? Reflecting a part of the eight-function model, the archetypal pairs of opposite in the drama offer a dynamic tool both for personal analysis and for analyzing films—including even those that lack a normal epic structure. Attention to the horizontal axes of the eight-function model—the Parent/Puer Aeternus and the Senex/Trickster—can reveal imbalances in the psyche. In analyzing a personal psychological drama, the functions, attitudes, and archetypes can be extracted without a personality assessment and a type code, as demonstrated above. In clinical work this is helpful when clients present with falsified or unclear type development. * Note that this paper deals only with the fictionalized ‘Bob Dylan’ portrayed in the film, not with Bob Dylan, the man. A complete analysis of the film is available in the paper titled, “Archetypal Drama in a Portrait of Bob Dylan,” by Hanne Urhøj, 2012. Beebe, J. (1988). Comment on Soren Ekstrom’s paper, “Jung’s typology and DSM-III personality disorder.” Journal of Analytical Psychology, 33(4), 345-350. Beebe, J. (2004). Understanding consciousness through the theory of psychological types. In J. Cambray and L. Carter (Eds. ), Analytical psychology: Contemporary perspectives in Jungian analysis (pp. 83-115), Hove and New York: Brunner Routledge. Beebe, J. (2005, Winter). Evolving the eight-function model. Bulletin of Psychological Type, 34-39. Beebe, J. (2007a, October). Type and archetype, part 1: The spine and its shadow. Australian Psychological Type Review, 9(2), 1-6. Beebe, J. (2007b, Autumn).Type and archetype, part 2: The arms and their shadow. Typeface, 18(3), 22-27. Dylan, B. (2004). Lyrics 1964-2001. Blowin’ in the wind (1962); The times they are a-changin’ (1963); Mr. tambourine man (1964). New York: Simon and Schuster. Haynes, T. (Director) & Moverman, O. (Writer). (2007). I’m not there [motion picture]. United States: Killer Films et al. Jung, C. G. (1921/1971). Psychological types (CW 6). H. Read, M. Fordham, G. Adler, & W. McGuire (Eds.). (R. F. C. Hull, Trans.). Princeton, NJ: Princeton University Press. Jung, C. G. (1953/1966). Two essays on analytical psychology (CW 7). (R. F. C. Hull, Trans.) Princeton, NJ: Princeton University Press. Jung, C. G. (1959/1968). Aion: Researches into the phenomenology of the self (CW 9 ii). (R. F. C. Hull, Ed. & Trans.). Princeton, NJ: Princeton University Press. Kalsched, D. (1996). The inner world of trauma: Archetypal defenses of the personal spirit. London and New York: Routledge. Urhøj, H. (2012). 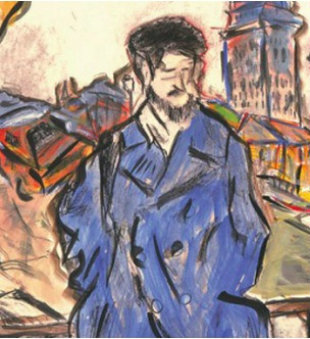 “Archetypal Drama in a Portrait of Bob Dylan.” http://www.saxo.com/dk/archetypal-drama-in-a-portrait-of-bob-dylan_pdf_sx18219026. Very interesting! Though I don’t know anything about Dylan or the movie, it still is good information about Beebe’s archetype model. One person I was discussing this stuff with, pointed out that traditionally, the Senex was the shadow of the Puer, and not of the Good Parent, but this article shows the connection between them. (i.e. “senex split from its puer aspect”). Re Eric’s comment: I think the Beebe model does not necessarily contradict the opposition between Senex and Puer discussed by Hillman and others.Rather it posits that the FUNCTION carried by the Puer archetype, the third function, is shadowed by its opposite-attitude function, which is carried by the Trickster archetype, as the sixth function is carried by the Senex archetype. This does not preclude opposition between the Senex and Puer archetypes, and Beebe has also discussed the opposition between Senex and Trickster, as the author here describes happening via the Jude Quinn character. If we consider ‘shadow’ anything that hasn’t come to consciousness, then any of our eight functions can have shadowy aspects, including the four preferred ones. So any of the corresponding archetypes could also have shadowy aspects. I agree. I see parent/child (both ego-syntonic and ego-dystonic versions), and the related functions as MIRRORING each other (opposite in both ways; function and attitude), while I too use “shadowing” for the relationship of the attitude-opposite ego-dystonic counterpart to it’s ego-syntonic parallel. 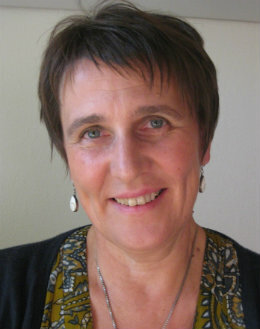 Hanne Urhøj is a Jungian analyst (IAAP) in private practice in Copenhagen, Denmark. In her practice Hanne uses the structure of archetypal pairs of opposites in John Beebe’s model on a daily basis, “to help clients not only to understand the plots in the inner drama but to spot what is usually being projected.” She has a Master’s degree from Roskilde University in sociological and technological planning and for many years has been a consultant in organizational change.